I don't really consider burglary a violent crime - just a property crime. Anyways, I wanted to see Sweden's immigration rate as well, but couldn't find any charts with both values (crime, immigration). The graphs in your first image are not comparing the same thing. 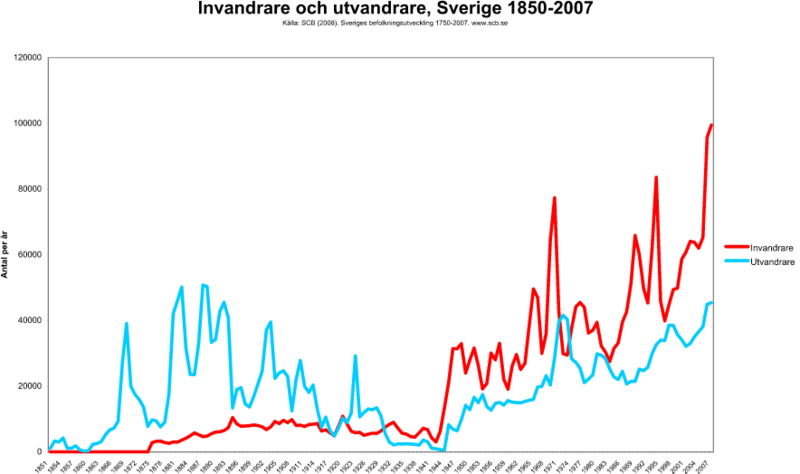 The Swedish red line measures the number of charges filed for violent crime per 100,000 citizens. It looks like the source is table 1.2 from the report Kriminalstatistik 2009, but it is hard to know for sure. The data for the American blue line comes form the Uniform Crime Reporting Program. This program was designed in 1929 to provide law enforcement agencies with accurate data on the development of crime. The whole point of the program was to produce statistics that were comparable year to year. 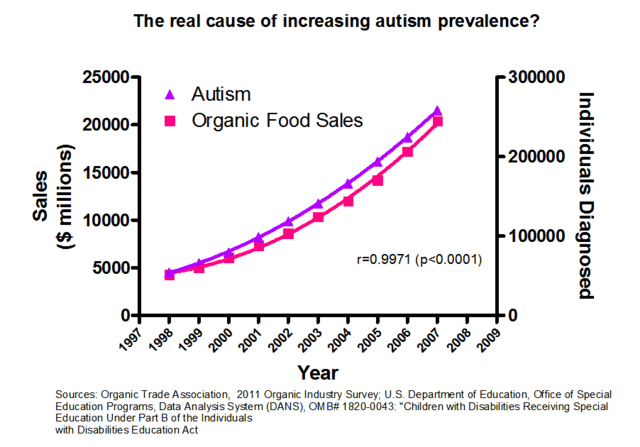 The graphs are therefore apples to oranges and highly misleading. The reason for the explosion in the number of charges filed are many and varied. I won't go in this answer because it is a different topic. But you can investigate statistics for Sweden's neighbours. They too have ten times as many charges filed today as they did in the 1960s. Now you might object and say "Wait a minute. 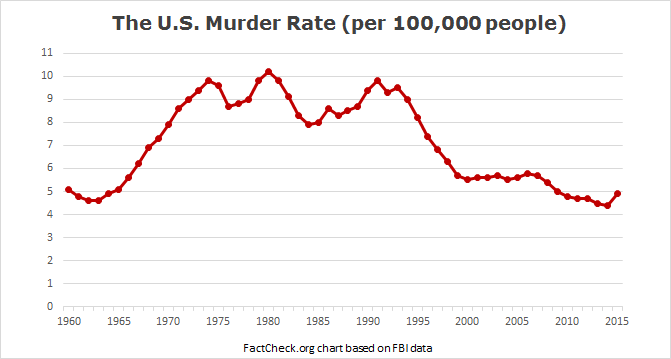 Homicides != Violent crime!" That is true and only a small fraction of all violent crime is homicide. However, tracking violent crime is notoriously different for many reasons, among them that definitions change. In 1960, beating your children was legal. Today it is a violent crime. Therefore we use homicide as a proxy for all violent crime. It has the added advantage that it makes it hard for government agencies to fudge the numbers. The data in these graphs come from so called victim surveys. The researches send out surveys and ask a sample of the population how many of them have been the victim of an assault. As you can see, the numbers haven't moved much since 1990. I hope that answers your question. Sweden has received a massive number of immigrants, but the amount of violent crime has remained roughly constant or even decreasing. The issue is far more complex than a simple historical rate comparison. You can find a summary of several reports here, and can access the reports by clicking the relevant links. A 2006 government report however suggests that immigrants face discrimination by law enforcement, which could lead to meaningful differences between those suspected of crimes and those actually convicted. A 2008 report by the Swedish National Council for Crime Prevention finds evidence of discrimination towards individuals of foreign descent in the Swedish judicial system. 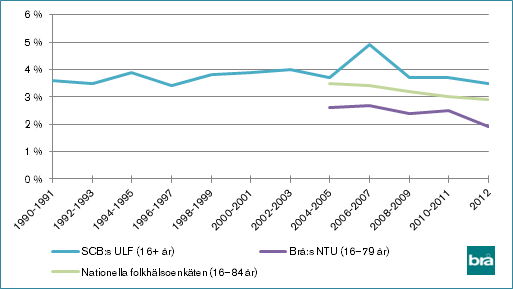 The 2005 report finds that immigrants who entered Sweden during early childhood have lower crime rates than other immigrants. By taking account of socioeconomic factors (gender, age, education and income), the crime rate gap between immigrants and natives decreases. A study using more comprehensive socioeconomic factors than the 1996 and 2005 reports found that "for males, we are able to explain between half and three-quarters of the gap in crime by reference to parental socio-economic resources and neighbourhood segregation. For females, we can explain even more, sometimes the entire gap." The authors furthermore found "that culture is unlikely to be a strong cause of crime among immigrants". In short, most crimes in Sweden (~60% of them) are committed by suspects born of 2 Swedish parents. However, immigrant males are more likely to be investigated (and possibly convicted, in part due to facing discrimination from the Swedish judicial system) than ethnic Swedes---this likelihood diminishes the younger the person arrives in Sweden, the higher their socioeconomic status, and their education level. In other words, not very different from any other society or place in the world: people with higher education, better social integration and life prospects, have little incentive to turn to violent crime. 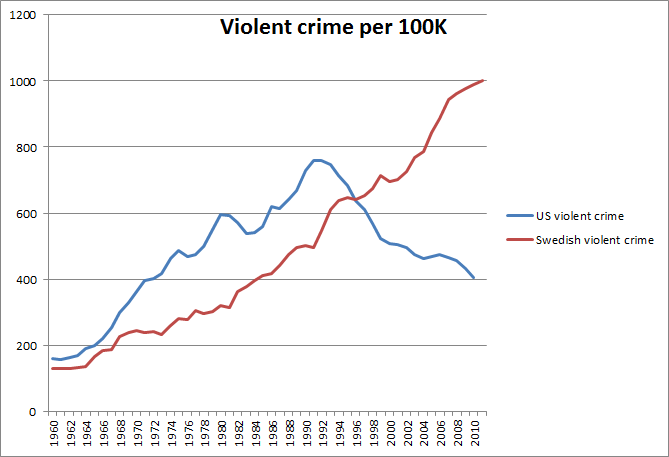 To more directly answer your question, Nationmaster.com has an accurate and verifiable comparison between crime in the US and Sweden, which disproves the chart in your question (given the lack of sources/data gathering methodology, etc.). Bonus: A personal anecdote, as an immigrant in another country (i.e., not Sweden). My two brothers and I emigrated (through proper legal channels) from a developing country traditionally associated with drug dealing and other crimes, to a developed country with low crime rates. We are all bilingual/trilingual, have professional degrees, same for our partners. Here, we've met other legal migrants from our country (civil engineers, special effects animators working in blockbuster movies, etc. ), who are also gainfully employed, pay their taxes, and pay into the public health care system. Many of us have had spells of unemployment, and none have turned to violent crime as a result---we do as everyone else does: update our resumes/linkedin profiles, go to job hunting sites, start looking. Others have gone back to school, gotten another credential, started a new job. However, one of these friends (say, John) met a fellow countryman (Peter) who came here illegally. Peter had never met another migrant from our country, and poured out his soul to John: that Peter's dad brought Peter illegally when he was just a boy, he grew up under unstable circumstances, and nowadays, Peter was a drug trafficker (yes, he shared as much). John, who wanted to stay on the Law's good side, didn't want to be associated with Peter, and left the party. So... same country, vastly different immigration and life conditions. Immigration alone doesn't increase violent crime, but unmanaged immigration (i.e., without resources devoted to promoting integration, education opportunities, and reducing discrimination/racism) will often create marginalized groups which, in times of need, can turn violent. Not the answer you're looking for? Browse other questions tagged immigration crime sweden or ask your own question. Do skilled immigration policies harm developing countries? Why do people oppose immigration ban?